This week brought 1 ARC and 3 review copies, 2 of which I’m VERY excited about. I’m already reading one of them now. 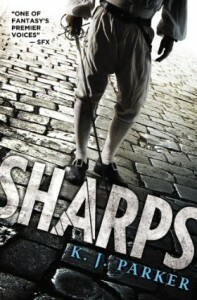 K. J. Parker’s latest book will be released on July 17 (trade paperback, ebook). I just started it this weekend. I haven’t gotten far yet since I’m trying to get caught up on reviews before going to BEA, but it’s very promising so far! Ever since reading The Folding Knife, I’ve wanted to read more by K. J. Parker so I’m really excited about reading this. The Folding Knife was fantastic and I’ve heard great things about Parker’s other books as well. The first Dreamblood book, The Killing Moon, was released earlier this month. I’m working on a review of it now that should be up sometime this week, but basically I loved it. It’s my favorite book I’ve read so far this year so I am really excited about reading the second book! 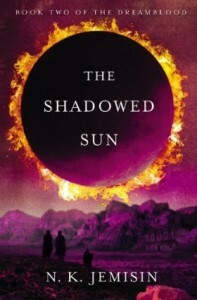 The Shadowed Sun will be released in trade paperback and ebook formats on June 12. Chapter One is available on the author’s website (she says that only chapter one is there right now because the following chapters have spoilers for The Killing Moon so it should be safe to read if you haven’t read that yet). Gujaareh, the city of dreams, suffers under the imperial rule of the Kisuati Protectorate. A city where the only law was peace now knows violence and oppression. And nightmares: a mysterious and deadly plague haunts the citizens of Gujaareh, dooming the infected to die screaming in their sleep. Trapped between dark dreams and cruel overlords, the people yearn to rise up—but Gujaareh has known peace for too long. This debut urban fantasy novel about werewolves will be released in trade paperback and ebook on June 5. According to the author’s website, this is the first book in a series although I can’t find the name of it there or on the press release that came with the book. 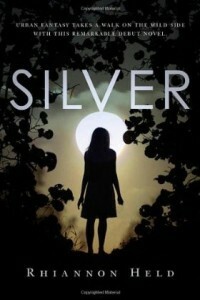 An excerpt from Silver is available on Tor.com. The first two Lords of Deliverance books are Eternal Rider and Immortal Rider. An excerpt from Lethal Rider is available on the author’s website. This book was released in mass market paperback and ebook formats on May 22 in the US and will be released on June 1 in the UK. I’m not much of a paranormal romance reader so I don’t know much about this series, but readers on Goodreads seemed to like this installment quite a bit.